Sarajevo - old meeting new. Part 1 of this post (including the why of our trip) can be found in Incidental Craft in Europe - Part 1. Handknitting was all over the place in Sarajevo, which was by far, one of our favourite places on our trip. Such an interesting city, great food and amazing people. We loved it. The knitting on the street was mainly similar to what we saw in Croatia. Worsted weight, naturally coloured yarn as a base and then either some colourwork or some embroidery. I saw the sweetest little vest, stocking stitch, garter border with flowers in dusty pink with green leaves running along the border. I'm still sad I didn't buy it - I had that crazy knitters purchasing dilemma - "….but I could make this." Common street stall of hand knits. Worsted weight, with embroidery over the top. The patterns were a total mix of styles but had a lot of natural colours. The colour was added as small bands of colourwork or embroidery. Sarajevo is being rebuilt but the signs of the siege are still incredibly prevalent. 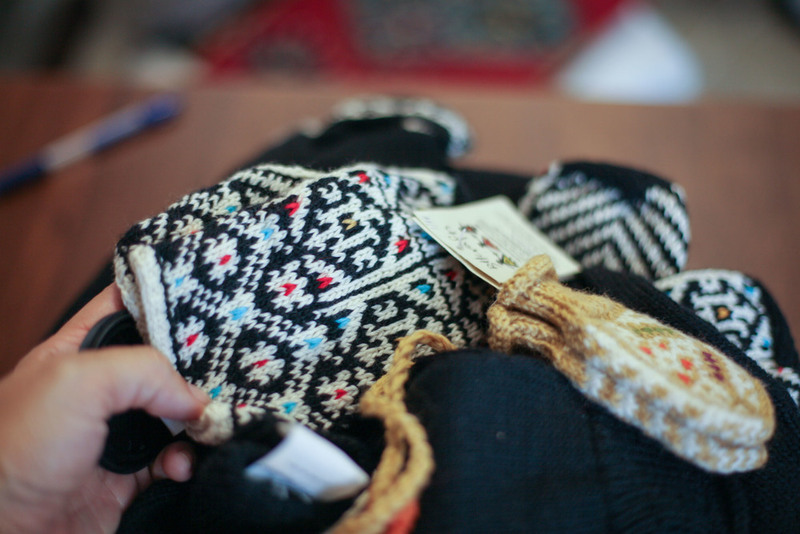 I did however buy the girls gloves from the Bosnia Hand knitters collective. The lady in the store didn't speak any English sadly, so I have no idea what they are made of, other than that it was the softest 100% wool. These gloves are truly divine. Baby mittens in the hand knitters collective. I adore the colourwork. More gorgeous colourwork. I am assuming the red was handsewn on after? The beautiful gloves I purchased for the middle kid. I was told it was wool but they feel to me like they have some alpaca. They are slightly silky in their softness but the yarn isn't over processed. Walking the kids up the hill to the Medieval Castle of Berat we weren't sure what to expect. What I didn't expect was embroidery. I'd heard that Berat was a centre for wood carving - which I didn't see at all. What I did see was wall after wall of these beautiful table cloths. Next to each set of tablecloths there was a woman with one on her lap, repairing and mending. I tried in passing, to find one that Anna would love, but hunger and the weather were against me and I left empty handed. There were also numerous women sitting around the castle site who were knitting colourwork Portuguese style. This was the first time I had seen it. I asked a couple of them if they would mind me taking their photo but they all said no. Fair enough. I am a little camera shy myself. And then on the way out of Albania in a mountain town that was incredibly beautiful*, we ran into this guy. He was happy for a photo. Honey stand on our way our of Albania. We did see more craft here and there of course, but one of the many things that I didn't get to do as much as I would have liked is to take photos….. I'm dreaming of a day when we can travel and I can stop as often as I would like to take photos. For the most part on this trip though, I had to practice what I tell my kids, "Take pictures with your eyes! They last longer - I promise". *I have no idea what the town was called as we weren't having the kind of day when we could really research the scenery - there was a little bit of angst flying around the car ;). That's how we rolled that day.